The Art of the Dynamic Shotgun, features over 5 hours of actual live fire class instruction and additional instructional material. The Shotgun is the most versatile and violent weapon in the arsenal but requires extensive training to master. 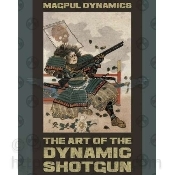 The Art of the Dynamic Shotgun, the newest title in the "Art of" Series. While it’s the most versatile and violent weapon system in the small arms arsenal, the shotgun brings a level of complexity that requires extensive training to master. Join Magpul Dynamics instructors, Travis Haley and Chris Costa as they guide a diverse group of shot gunners up an intense ladder of excellence. On this journey, the viewer takes a student perspective, benefiting as the students identify and solve problems with a variety of shotgun platforms. This 3 disc instructional set progresses quickly as it covers the fundamentals of shotgun manipulation, pattering, weapon's configurations, actions types, ammo management, and real life complex scenarios for the Home Defender, Law Enforcement Officer, Military Operator, and Competitor.